Utah; Utah State Guide; American Guide Series; New Deal; Works Progress Administration; WPA; Federal Writers’ Project; FWP; Federal Project One; Tourism; Great Depression; Sipapu Natural Bridge; Natural Bridges National Monument; Utah Monuments. Images of pictures of Sipapu Natural Bridge and the Natural Bridges National Monument from “Utah: A Guide to the State”, the Utah State guidebook from the American Guide Series created by the Utah Federal Writers’ Project during the New Deal. Utah State University, Merrill-Cazier Library, Special Collections & Archives, Book Collection 39 no. 44. Page 43. 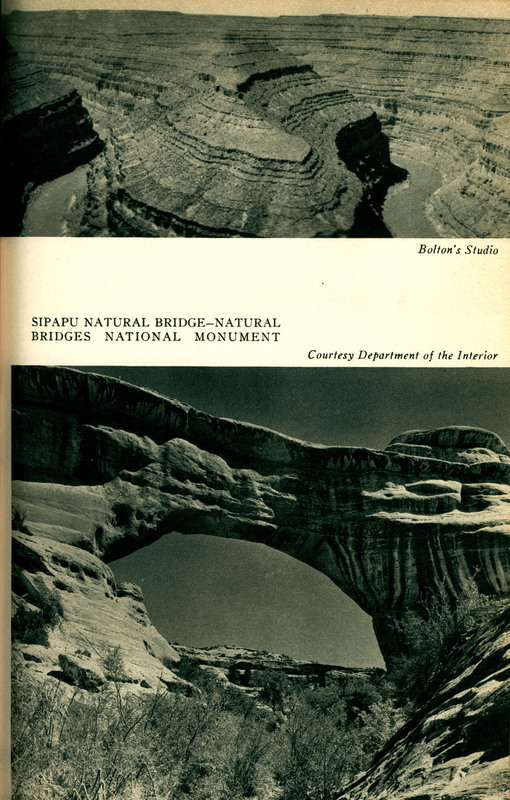 The Utah Federal Writers’ Project, “Utah State Guide image of Sipapu Natural Bridge-Natural Bridges National Monument,” USU Digital Exhibits, accessed April 20, 2019, http://exhibits.lib.usu.edu/items/show/18782.